Humans have had bad breath forever, but in the 1920’s the fine folks at Listerine honed in on Americans’ social anxiety and created one of the most advertisey terms America has ever heard: halitosis. Halitosis sounds severely medical, and that is completely by design. In the 1920’s, Listerine wanted to sell more mouthwash. Up to that point the company advertised the antiseptic as floor cleaner, dandruff and foot odor cure, and mouthwash among other things, so they needed something to drive shoppers to purchase the product. Gerard Lambert, son of Listerine owner Jordan Lambert, found a winner when he created an alarming “condition” known as halitosis. Essentially Mr. Lambert just mashed up some Latin and Greek roots (halitus Latin for “breath” and -osis Greek for “diseased”) and advertised it as a medical condition. Why did the ‘halitosis’ stick? Here’s where the real brilliance of Mr. Lambert and the Listerine advertising department is on display. They didn’t just slap the word ‘halitosis’ on their product and say “Have fresh breath!” They drilled deep into the American psyche and played on shoppers’ fear of social exclusion. Listerine launched a campaign focusing on Edna, an attractive but lonely young woman struggling to find a husband. They photographed a lonely-looking Edna with the tagline “Often a bridesmaid but never a bride,” exploiting the pressure on young women to get married and blaming her failure to wed on halitosis. 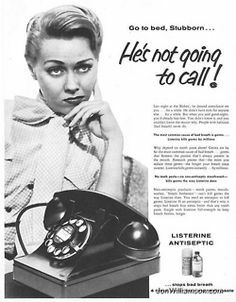 Listerine ran several other ads similar to the Edna ads, mostly focusing on the damage halitosis can have on one’s popularity and love life. Their sales skyrocketed and Listerine is now a household name synonymous with fresh breath. Highly manipulative but also effective. How is halitosis doing today? You’ll be hard pressed to find the term halitosis in most supermarkets and drug stores today. In this day in age, most companies use ‘bad breath’ or ‘fresh breath’ in an attempt to be more relatable to shoppers. However, the impact of the Halitosis Revolution still lingers today. Listerine is a household name, and oral hygiene companies still focus on fresh breath in social settings. Halitosis sounds like quite a scary condition, but let’s keep things straight; chronic bad breath is the byproduct of more serious conditions, such as periodontal disease and tooth decay. Rarely if ever will your doctor diagnose you with ‘halitosis’. However, if you tell them that you have been experiencing chronic bad breath, they will likely be able to find the true cause of the symptom.